THIS is a RESENT copy because the second attachment was not a jpeg file. Doc files don’t show up in our e-News files. The DMN e-News and an occasional hard copy DMN News are published by the Dunn’s Marsh Neighborhood Association (DMNA) on an “as-needed” schedule. The Dunn’s Marsh Neighborhood Association, Inc. has been working to unite neighbors to solve mutual problems and promote fellowship among neighbors since 1973. Our neighborhood is in Madison & Fitchburg. On Facebook: Type Dunn’s Marsh Neighborhood Association into the Facebook search box. 2 - Have an Opinion, But Can’t Go to the Hearing? Zimmer's Liquor Store has been sold to a new owner, and that owner, Gurpreet Ghuman, wants to open her own liquor store in the building. The new owner of the location at 4217 West Beltline Highway must first get a liquor license in her own name. The hearing about issuing the license comes before the Madison Alcohol License Review Committee this coming Wednesday, November 16. The meeting starts at 5:30 pm in Room 201 of the City County Building, 210 Martin Luther King, Jr., Blvd. Although this item is #21 on the agenda, items are often moved up when there are people wanting to speak for or against the license. There’s an etiquette you’ll want to know if you wish to speak before the committee. 1. Arrive early enough to park, walk to the building, locate the room, find the registration forms, and fill them out before the meeting time of 5:30. 2. Fill out the form. It asks you to list your name and maybe your address, the agenda item (#21), whom you represent (yourself), and check offs - for/against, wishing to speak/not wishing to speak. 3. Hand in the form to the person collecting them at the podium. 4. When the item comes up, you will be allowed only 3 minutes to speak. It helps a lot to write out and time your talk. If you don’t want to write it out, at least have outline notes, and practice it to see if it fits in the 3-minute limit. To see the application, look at the attachment, or go to http://www.cityofmadison.com/rss/alrc.cfm <http://www.cityofmadison.com/rss/alrc.cfm> If you use the link, you will have to click on the agenda, and then go down to item 21. It is interesting to this reporter to see that the new owner is so confident of receiving a license that a brand new neon green poster on the door of the former Zimmer’s says there will be a Grand Opening of the store under new management on Friday, November 18. Those who have a strong opinion on whether the alcohol license applicant should or should not be granted a license have another option in how to make that opinion known. By snail mail, write to City Clerk, City-County Building, Room 103, 210 Martin Luther King, Jr. Blvd., Madison, WI 53703. However, since Madison’s mail now is transported to Milwaukee before being sent to addresses in Madison, there’s probably not time to mail a letter. You could hand deliver a letter to the Clerk’s office. Eleven people gathered at the Zimmer’s Liquors building at 4217 West Beltline Highway on a sunny but brisk Thursday morning, November 3. All were there to talk about the change in ownership of the liquor store and the new owner’s application for a Class A Liquor and Beer license. Liquor licenses cannot simply be passed on. They belong to the owner, not the premises. Manpreet Ghuman, husband of the applicant for a liquor store to replace Zimmer’s, gave a short presentation and then answered questions. His wife Gurpreet Ghuman is the applicant. She did not attend the meeting. Mr. Ghuman explained that the application is in his wife’s name because the money for purchase came from sale of her family’s land in India. The Owner’s Family. Mr. Ghuman portrayed himself as a family man with 2 young children and noted that his family would run the store - he, his wife, and his mother. Later he said that he would be the one managing this store while his wife and mother would be in charge of their Rocky’s Liquor store at 4429 Milwaukee Street. They’ve had that store for 2 ½ years. His own family had been in the alcohol business for 20 years, he said. His wife is the licensee for the Milwaukee store as well as the applicant for the Zimmer’s location. Attendees had a lot of questions and concerns. Problems Next Door. Staff members from the immediate nextdoor neighbor, NAMI (National Alliance on Mental Illness) pointed out that liquor store customers often park on the NAMI property and that NAMI has had to call 911 due to drug deals made there by liquor store customers. When Mr. Ghuman said that he’d have cameras outside the liquor store, he made it clear that he would only be monitoring his property. “NAMI should get their own cameras,” he said. In further talk, Mr. Ghuman was hazy on what kind of camera system he would install. When someone asked how long the recordings would be saved, he said, “I don’t know: it depends on the system.” He also could not say how often he would review the recordings. Inebriated or Underage Customers. Another issue was about selling alcohol to inebriated customers. Nearby neighbors have experienced cases where people have passed out in their yards. Mr. Ghuman said he would not sell to customers who were alcoholics or were drunk. He also suggested that the neighbor who brought this up didn’t know if the unconscious persons had purchased alcohol at the store. He mentioned that the city has a list of people that liquor stores are not supposed to sell to. Whether these are the people who have passed out in local yards is another question. But, he added that he was responsible only for people on his premises, not what they do after they leave his store and property. Apparently, the issue of people who have over indulged is not only a problem in local yards. In response to the article that appeared on November 4 in the Wisconsin State Journal about the informational meeting, a new Fitchburg resident who lives about a mile from the store e-mailed about experiences he had had with two different inebriated men. One was face down on the concrete near the store. Another passerby and he stopped and called 911. The other man had been walking drunkenly down Seminole Highway, and again this new resident called 911. It was determined that both men had purchased their alcohol at Zimmer’s. Concern was also expressed about underage drinkers. One attendee said that her underage son had often taken the bus to Zimmer’s in order to buy alcohol and drugs. Mr. Ghuman said that of course he wouldn’t sell to underage drinkers. He also said he’d look outside to see that there weren’t undereage drinkers sitting in cars waiting for alcohol to be purchased for them. Litter. Others brought up the litter problem on the frontage roads and nearby streets. They asked if the new owner would cooperate in picking up the alcohol bottles that accumulate nearby. Mr. Ghuman assured everyone that he would keep his own property cleaned up. But he bristled at the idea of picking up litter anywhere else. “You can’t even prove that those bottles came from the store,” he said. He also said that he could not ask his employees pick up litter that accumulates on the other side of the frontage road from the liquor store “because of liability.“ He did not answer Alder Dorothy Krause’s question about whether he could work with the Court system to use helpers who were court-ordered to do community service. The majority of alcohol containers found discarded on the frontage roads and on Britta Parkway are the 50 milliliter “airplane” bottles. A recent few days of picking litter from the frontage roads starting at Seminole and going all the way to the Summit entrance to Verona Road found that 53% of the alcohol containers were bottles that size. (Others ranged upward to 750 mL.) One person asked if the Ghumans would be amenable to not carrying the little one-dose bottles. Mr. Ghuman said that a condition of a license in the campus area was that airplane bottles not be sold. It seemed that he would rather be able to sell them, but if the City required it, he would not carry them. Plans. The conversation turned to his other plans. He said he asked the Zimmer staff to work for him, but they had refused. The store would be closed from November 11 to November 18 for clean-up. He would be asking for a temporary license to operate starting then even though the City Council wouldn’t be scheduled to approve the license until December 6. A call to the City Clerk’s office turned up the fact that a Provisional License can be issued to a new owner if the ALRC has recommended approval of the license and the premises has passed all inspections. This “pre-City Council” license is issued because the City Council ordinarily rubber stamps whatever the ALRC recommends. The staff member estimated that only about 1 in 200 cases has the Council chosen a different action than the ALRC recommends. Meeting Attendees. Attendees at the meeting included 5 neighborhood residents - Annette Shesman, Patty Stockdale, Fitchburg Alder and County Supervisor Dorothy Krause, DMNA President Mary Mullen, and DMNA Council member Thea Bach. Also attending were business neighbors Nate Schorr and Crystal Hester from NAMI, Joe Schlesing from the Meadowood Community Center, Barry Adams from the Wisconsin State Journal, and one other person who preferred not to be named. One of the attendees at the informational meeting about the liquor license application for the Zimmer’s location was Wisconsin State Journal reporter Barry Adams. He wrote an article for the paper. In the article, published on November 4, he says that the Dunn’s Marsh Neighborhood Association opposes the liquor store. 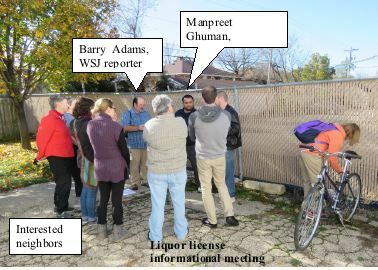 In actuality, at the time of the November 3 informational meeting, the people attending the DMNA annual meeting [October 27] had only taken a position to inform the neighborhood of the meetings about the liquor store. Since the informational meeting, the newly-elected DMNA Council held its organizational meeting and passed a motion regarding the license application. The motion passed on November 11 asked only that conditions be placed on the liquor license if one is issued. Did you recently see an older woman in a construction green neon shirt with an orange pail, a white pail, and a garbage bin labeled Marlb Garden along the frontage road? That was me. Periodically I pick up litter along the Beltline and Verona frontage roads. Almost always I separate the “treasure” into 3 categories: alcohol containers, non-alcohol recyclable containers, and everything else. “Everything else” is styrofoam, paper products, snack bags, plastic bags, cellophane fragments, and anything else that isn’t recyclable. I went out on 3 different sunny, warm days in November. November 3, November 5, and November 10. 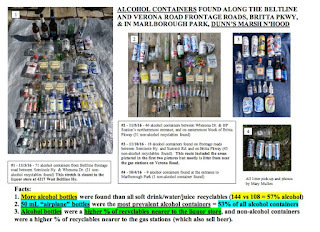 I also had picked up drink containers in Marlborough Park on October 4. What did I find? First of all, more alcohol containers than combined soft-drink, juice, and water bottles and cans. The ratio was 144 to 108. Secondly, 2 pretty full small garbage bins of non-recyclable litter. I would have filled more bins, but I was running out of time and eventually just picked up recyclables and left the rest of the litter where it lay. Finally, I found a larger proportion of alcohol bottles nearer to the liquor store and more soft drink, juice and water bottles closer to the gas stations that sell those kinds of beverages as well as beer. It was only on the day that I combed the area that included the Verona Road frontage road that the alcohol containers were exceeded by water/juice/soft drink containers. The ratio that day was 18 alcohol vs 45 other. 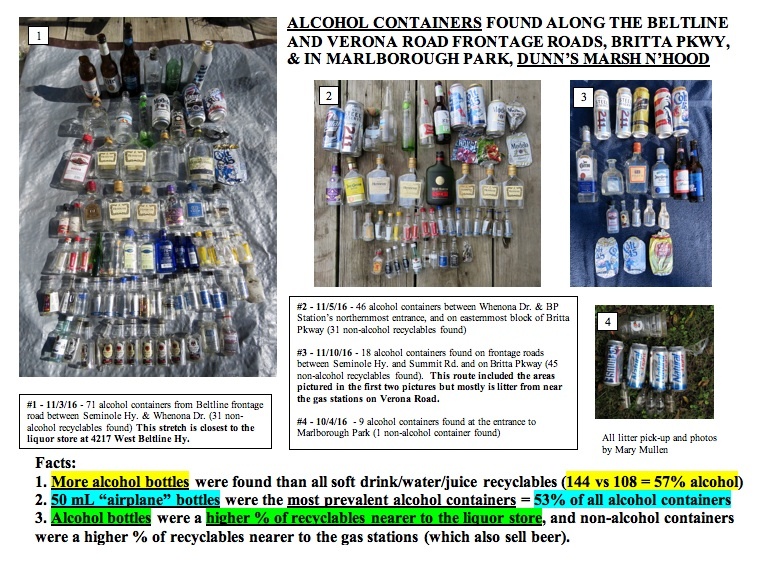 Along the Beltline and in Marlborough Park, alcohol containers greatly outnumbered the non-alcohol containers. One day it was 71 alcohol vs 31 non-alcohol containers. Another day it was 46 alcohol vs 31 non-alcohol containers. In the park, it was 9 alcohol containers and 1 pop can. For those who like statistics, I did keep track of the kinds of alcohol containers I found. Not counted are the 10 or so bottles crushed into the grass by mowing machinery. A peaceful election on October 27 and an even more satisfying first Council meeting brought a transfer of power to the Dunn’s Marsh Neighborhood Council. The DMNA Council is the governing body of the Dunn’s Marsh Neighborhood Association. Seven members of the Council were chosen at the DMNA Anuual Meeting on October 27. Five of the six were returning members. Those elected that night - in alphabetical order - were Thea Bach, Yannette Cole, Faith Cholvin, Elvice McAlpine, Mary Mullen, Shonita Roach, and newcomer Peter Schmitt. Peter had served on the Council several years ago. Because the Council can be as large as 12 members, more members were sought. Two more volunteers rose to the occasion at the first meeting of new Council on November 10. They were Dale-Harriet Rogovich and Sam Shesman. Both are complete newcomers to the DMNA although Dale has lived in the neighborhood since 1973. Sam just moved here in April. Elected as Vice President was Shonita Roach, a resident of the Allied area of our neighborhood. This is her second year on the Council. Elvice McAlpine, who has had half a term as secretary, agreed to continue in the post for the coming year. Elvice represents the Belmar part of the neighborhood and is starting her third year on the Council. Finally, Faith Chovin volunteered to take over the treasurer’s position. That was the post that Yannette Cole held for the past 2 years. Faith represents the Crawford area of the neighborhood and is starting her second year on the DMNA Council. We thank the retiring members from last year who did not find it possible to continue: Karen Walters, Susan Watson, Tony Williams, and Sina Davis. Dunn’s Marsh Neighborhood Council representatives are the people who make decisions for the DMNA between membership meetings. Their positions and contact information is provided so that you can contact them with your concerns or ideas for how to make this neighborhood and even better place to live. The small map shows where each of the 4 areas are that Council members represent. We still have room for 3 more people on the Council. We’d like to get at least one from the Belmar area and one from the Crawford area. If you think you might be interested, contact one of the current members and then come to the next Council meeting on Thursday, December 8, 6:30 pm, at Prairie UU Society, 2010 Whenona Drive. Annual meeting attendees each received this list of DMNA accomplishments during the past year. DMNA Council met every month Nov. 2015-Oct. 2016 (although 3 times we did not have a quorum), and members set priorities for the year; planned DMNA events; kept up on buying club, grocery store, home-building progress and other issues; and heard informational speakers. Invited speakers were Co. Supervisor Richard Kilmer, Deirdre Garton from the Verona Road Business Coalition, Ravi Singh from the BP service station, Police Officer Mike McWhinney, and Brad Herrick and Michael Hansen from the Arboretum. (Council members who attended the majority of meetings: President Mary Mullen, Secretary Elvice McAlpine, Treasurer Yannette Cole, Thea Bach, Faith Cholvin, Shonita Skinner, and Susan Watson; other members Karen Walters, Tony Williams, and Sina Davis). Published 6 issues of the Dunn’s Marsh Neighborhood e-News (by e-mail on 2/9, 3/31, 6/20, 7/31, 10/25 and 10/26) and 3 hardcopy flyers (6/17, 8/1, & 10/24, delivered door-to-door to over 600 residences). Content & design by Mary Mullen; delivery by Thea Bach, Sharon Grant, Pam Flinn, Mary Mullen, Faith Cholvin, Kim Zinski & daughters Sage & Olivia, Elvice McAlpine, David Martin, Kent Seeker, Julie Lyne, Mary Somers, Patty Stockdale, Donna Sarafin, James Luscher, Tony William, Melanie Sax, & Rachel Potter. Our Treasurer Yannette Cole developed an all-new website www.dunnsmarsh.org <http://www.dunnsmarsh.org> which required uncounted hours of her time. It is now hosted through GoDaddy. Co-sponsored Make Music Madison with Prairie UU Society & provided volunteers to help run the day, 6/21. (Mary Mullen, Yannette Cole, Elvice McAlpine, Faith Cholvin, Patty Stockdale). Neighborhood performers included Mary Mullen and Jesse Cole. Attendees for each act ranged up to 41 people, with an average of 30. The community participated in a Maypole dance at the end of a beautiful day. Although the annual meeting of the Dunn’s Marsh Neighborhood Association was not very well attended, members accomplished the necessary work. Representatives to the Neighborhood Council were chosen, as detailed in previous articles. People got a chance to say what they liked about the neighborhoood and what they thought the DMNA should work on during the year. Ideas filled a flipchart page. Attendees learned that the organization is solvent, with an ending bank balance of $1,128.53 - $4 more than the starting balance of October 2015. Most of our funding goes to communicating with the neighborhood. Most of our income comes from dues, donations, and advertising. A new by-law change was voted in with the purpose of helping the Council maintain a quorum. During the past 2 years the Council had several meetings without a quorum due to low attendance. The by-law change defines what is deemed a resignation: “Three consecutive absences from Neighborhood Council meetings without valid excuse or without informing the President or Secretary of the Association, or five absences for any reason -- consecutive or not -- within a term of service, shall be deemed a resignation.” The language in italics is new. We heard at length from our Madison Alder Maurice Cheeks about progress toward a grocery store in the neighborhood. A market study has been completed. The findings were that a small “corner store” or a store connected to some other attraction such as a neighborhood center would be most likely to be successful. Putting a store in a “business district” might be another way to bring in customers. Besides Alder Cheeks, 2 other elected representatives attended the meeting, Fitchburg Alder and County Supervisor Dorothy Krause, and County Supervisor Richard Kilmer. Co. Sup. Krause represents the Fitchburg part of the neighborhood and Kilmer represents the Madison portion. We thank all 3 representatives for taking the time to join us for our meeting. Want to know what’s happening in the neighborhood and what the Dunn’s Marsh Neighborhood Association is doing? There are 3 good ways to do so. 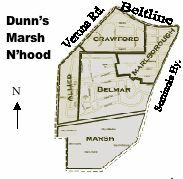 For day-to-day information, check out our Facebook page, Dunn’s Marsh Neighborhood Association. For a much broader picture, look at our website www.dunnsmarsh.org <http://www.dunnsmarsh.org> There you can learn about our history, our bylaws, our publications, our parks and open space, the many bike trails, and about other community resources. We’ve been around since 1973! Through the calendar on the home page and another separate calendar page where you can see whole months at a time, you can learn about meetings of the DMNA Council and of the Allied Community Co-op that is working on a grocery-buying club as well as on getting a grocery store. There’s lots more, and lots of photos. You can also join the DMNA and pay your voluntary dues online and find other volunteer activities. The third way to keep up is to attend the monthly Dunn’s Marsh Neighborhood Council meetings. They are held on the second Thursday of the month, 6:30 pm, at Prairie Unitarian Universalist Society, 2010 Whenona Drive. (Enter on the Crawford Drive side.) Any resident is welcome to attend. The next meeting is December 8.